Birds-eye view of tents and buildings at Camp Deep Creek. 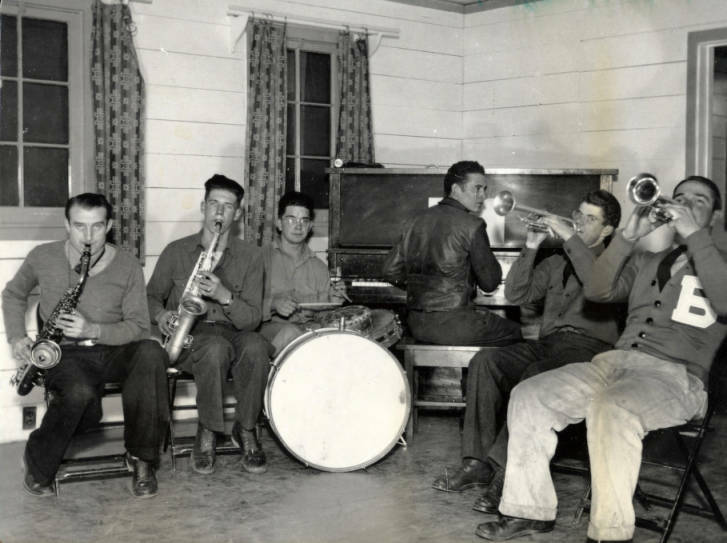 Six young men play instruments (saxophone, drums, piano, trumpet) as the Camp Heyburn State Park band. A view of Camp Heyburn trees and buildings. 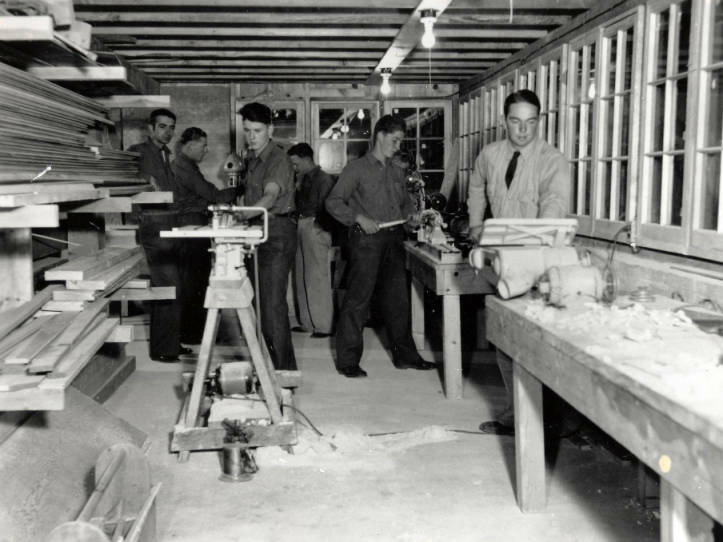 CCC men participating in a carpentry class. Manning Crevice Suspension Bridge, built on the Salmon River Road Project by CCC men. 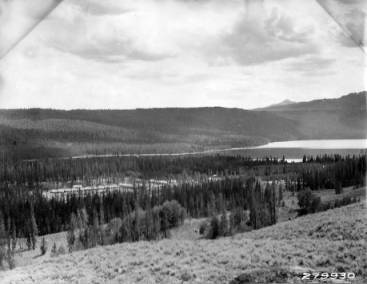 View of Redfish Lake CCC Camp and Redfish Lake, Idaho. View of Redfish Lake CCC Camp and Redfish Lake, Idaho. Sawtooth Mountains loom in the background. View of rows of tents surrounded by trees at Camp Deep Creek. Three men build campground tables at Camp Ketchum, Sawtooth National Forest, Idaho. Three men installing campground stoves at Wood River Campground, Camp Ketchum, in the Sawtooth National Forest, Idaho. CCC men building campground tables and toilets at Camp Ketchum, in the Sawtooth National Forest, Idaho. CCC men constructing camp tables at Camp Benedict, Sawtooth National Forest, Idaho. Sawtooth Mountains loom in the background. CCC men installing campground stoves at Wood River Campground, from Camp Ketchum, Sawtooth National Forest, Idaho. Roadside cleanup by CCC men from F-94, in Targhee National Forest near Osborne Springs and Ashton, Idaho. The front view of the Heyburn State Park entrance sign. The sign reads: 'Entering Heyburn State Park'. Exterior view of Lake Chatcolet Shelter at Heyburn State Park. Several CCC men sit around a table reading while attending a class at Camp Heyburn. A view of the mess hall at Camp Heyburn. Lodge under construction at Heyburn State Park. Lodge under construction at Heyburn State Park. A man poses on the roof. Lodge under contruction at Heyburn State Park. Men pose on top the structure. Lodge under contruction at Heyburn State Park. Group picture of the CCC Company stationed at Camp Heyburn. Lodge under contruction at Heyburn State Park. Men assembling the roof. Exterior view of the completed lodge at Heyburn State Park. An interior view of the recreation hall at Camp Heyburn. Shelter construction at Camp Heyburn. A man stands inside the shelter. An exterior view of the quarters of the Supertintendent of Camp Heyburn. Wishing well at Camp Heyburn. Wooden sign to entrance of tent camp reads 'Civilian Conservation Corps Company 952'. Handwritten note reads: 'Road No. N'. 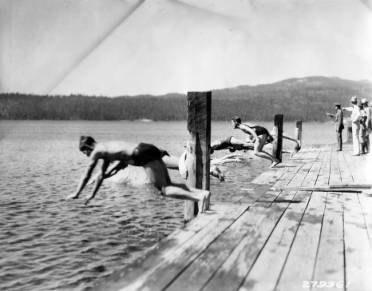 Four young men in swim trunks stand near a natural swimming pool dammed by rocks and logs. View of a natural swimming pool dammed by rocks and logs next to a wooden building. Two CCC men use machinery as part of the work crew building Magruder Road in the Bitterroot National Forest. An aerial view of Camp McCall on Payette Lake. Men at work leading a pack train on a mountainside road. Riggins, Idaho. Dynamite blasting for a road near Riggins, Idaho. Men at work on a mountainside along a river. Potentially moving rocks to build a road. Bridge under construction and temporary bridge. Dynamite blasting for a road near Salmon, Idaho. CCC men in a river working on a fish weir. A view of tents and buildings at Camp Warm Lake. Note building under construction in the bottom right corner. Birds-eye view of a river and surrounding area. Trucks, hauling men and supplies, arriving at CCC Camp Pine Creek, near Pierce, Idaho. Group portrait of Camp Troy personnel, Company 244, Troy, Idaho. Writing on the photo reads: 'Leo's Studio 19-398'. Group portrait of Company 1224 posing at Camp F-46 near Clarkia, Idaho. 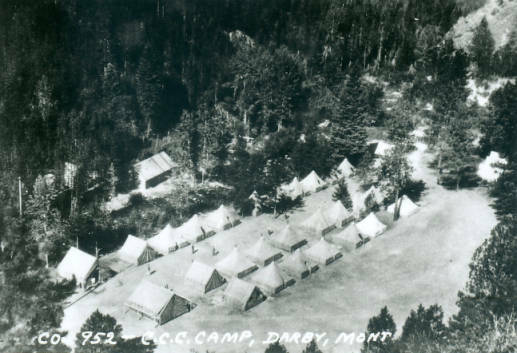 View of a temporary CCC camp at Remount Depot in the Lolo National Forest, Montana. Several CCC men washing up at temporary CCC Camp Remount Depot in the Lolo National Forest, Montana. Several CCC men making the foundations for barracks at Remount Depot CCC Camp in the Lolo National Forest, Montana. Four CCC boys pouring the cement for the guard station at Redfish Lake in the Sawtooth National Forest, Idaho. Trucks loaded with men, near the Crevice on Salmon River, 1935. Fenn Ranger Station near Selway River. The sign on the building says: 'Nez Perce National Forest Fenn Ranger Station'. A view of French Creek Camp in Nezperce National Forest, Idaho. Glover Creek Camp CCC boys posing for a photo, Selway River, 1935. 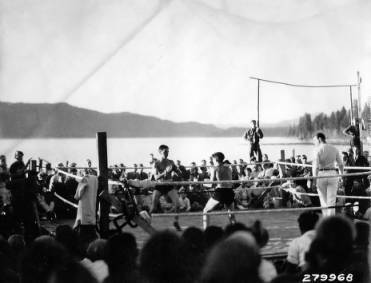 A group of men pose in the Camp Kalispell Bay boxing ring, F-142 at Priest Lake, Idaho. Men from CCC Company 1994 standing in line for payday at Camp Kalispell Bay, F-142 at Priest Lake, Idaho. Aerial view of Camp Kalispell Bay, F-142, on Priest Lake, Idaho. Glover Creek CCC camp on Selway River, 1935. Aerial view of the Forest Experiment Station and CCC Camp F-127, Company 573, Priest River, Idaho. A view of Camp Kalispell Bay, F-142, where Company 1994 was stationed. Photo taken in February. A view of CCC Camp Big Creek number 2, F-132. View of Cataldo CCC Camp and the surrounding valley. View of Hayden Creek CCC Camp and surrounding scenery. Writing on the photo reads: '28-109 F-180 Hayden Creek'. View of three buildings under construction at Hayden Creek CCC Camp. One construction worker stands in the foreground. Glover Creek CCC camp men loaded in truck. 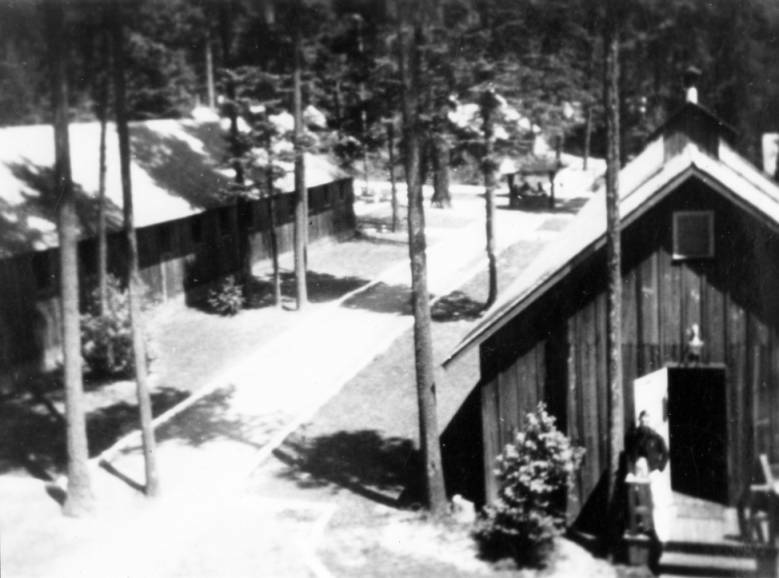 A view of the Hawk Site Ranger Station and CCC Camp used during the construction of the Sissons Bridge. Manning Bridge across the Salmon River, Idaho National Forest, Idaho. Built by CCC boys in 1934. Suspension tower at south end of the Manning Crevice Bridge, built by CCC boys in 1934. 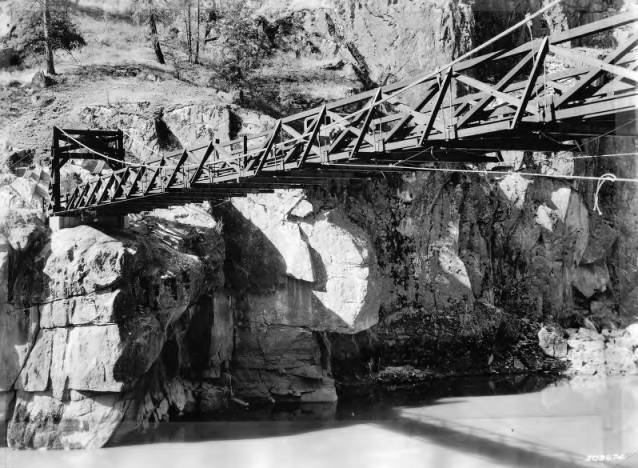 Manning Crevice Bridge over the Salmon River, 1940, Idaho National Forest, Idaho. Writing on the photo says: '406184'. Group portrait of nine CCC men in front of an automobile at Hayden CCC Camp. Group portrait of CCC men at Hayden Creek CCC Camp. Writing on the photo reads: 'F-180 Leo's Studio'. Men with a 'cat' in winter at Camp Red River, Idaho. Group portrait of two CCC men at Hayden Creek CCC Camp. Writing on the photo reads 'Leo's Studio'. Group portrait of five CCC men at Hayden Creek CCC Camp. Writing on the photo reads: 'Leo's Studio'. Group portrait of two CCC men at Horse Heaven CCC Camp. Writing on the photo reads 'Leo's Studio Spokane'. Unclothed man prepared to throw a discus and poses for the camera. 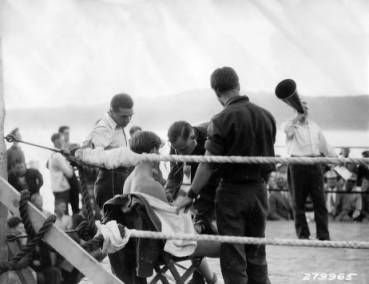 Back of photo reads: 'Magee 1935'. Aerial view of Blow Down 2 CCC Camp, F-159. Writing on the photo reads: 'Leo's Studio'. Bird's-eye view of CCC Camp near Riggins, Idaho. Salmon River near Elkhorn Creek, Idaho. The crossover is for Howard Ranch. CCC men dismantling Camp Packer Meadows, in the Lolo National Forest, Aug. 1933. View of a CCC Camp near Avery, Idaho in winter. Back of photo reads: 'Avery'. View of CCC Camp Heyburn, SP-1, and a truck. Back of photo reads: 'Heyburn'. View of CCC Camp Heyburn, SP-1. Back of photo reads: 'Heyburn'. View of St. Joe River CCC Camp, F-187. Writing on the photo reads: 'CCC Camp F-187 St. Joe River'. CCC Camp F-142 in winter. Forest fire near camp F-159, which housed Company 1235. Tent frames without cloth walls.